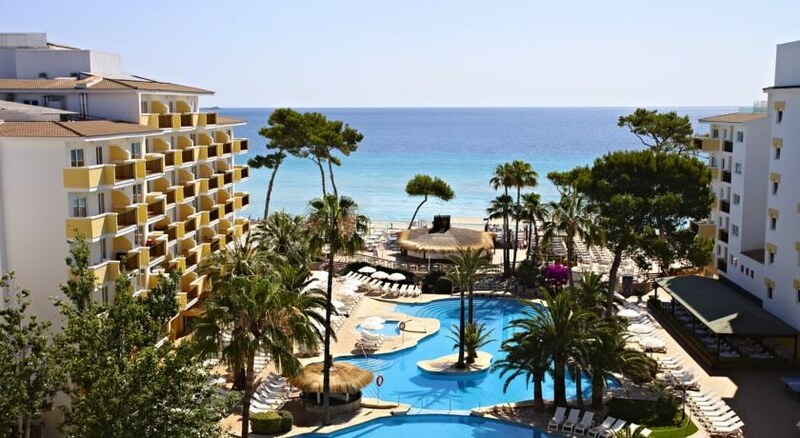 The Alcudia Park Hotel sits directly on the sandy Playa de Muro beach, in the picturesque bay of Puerto de Alcudia. Perched at the edge of the tropical S'Albufera Nature Reserve, the hotel is a beautiful choice for families, couples, friends and those travelling solo. There are 366 contemporary apartment rooms and studios dotted across the hotel's five buildings, each surrounded by attractive gardens, plus a large lagoon-style swimming pool area to relax in (one pool indoors too), including an exclusive children's area complete with a pool, playground and kids club available. When you're not taking advantage of the 24-hour service at Alcudia Park Hotel, make the most of the hotel's sumptuous spa 'Sensations', where you can take a dip in the traditional Turkish thermal baths, relax with a hydro massage or spend time in the sauna. Other entertainment facilities include a mini club (4-7) maxi club (8-12) and teen club (13 – 17) which caters to younger visitors staying at the hotel, not forgetting direct access to the sandy beach. Alcudia Park Hotel features one restaurant and three bars, serving up fantastic Majorcan cuisine, drinks and snacks. 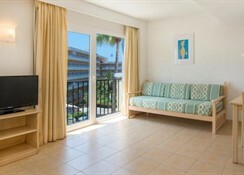 The Alcudia Park Hotel is located on the Playa de Muro beach in the bay of Puerto de Alcudia. 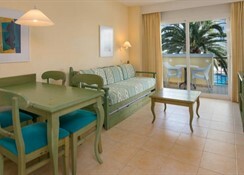 It’s situated 44km from Palma de Mallorca International Airport and 8 km from Alcudia’s city centre. The pretty town of Ca'n Picafort is just 3km away, while S'Albufera Nature Reserve is 1.1 km and Alcudia Old Town about 4.5km. Alcudia Park Hotel has a variety of room types to stay in, all with a welcoming, Mediterranean-style ambience – think pastel shades and cool tiles. Guests can choose from Junior Suit, Priority Location Junior Suite, Double, Superior Double, Family Rooms (both pool and sea view available), and the all-new Star Prestige range of rooms for ultimate luxury. Gastronomy at Alcudia Park Hotel is varied, serving authentic Mediterranean cuisine and traditional Majorcan cooking in the main restaurant. The beachside Dunas Snack Bar is perfect if you want to stop for lunch and a cold drink, while the sports bar is where guests can catch up on their favourite games or listen to live music. For Star Prestige guests, the sky bar Star Prestige is a scenic hangout overlooking the Bay of Alcudia. Enjoy a swim in the outdoor swimming pool, overlooking manicured gardens, relax in a sun-lounger on the terrace or go down to the beach for some sunbathing or watersports. If you’re feeling active, get a game of tennis, billiards, aerobics, aqua gym, rifle shooting, and archery are available. Or you can also go on bicycle tours if you want to explore the beautiful surroundings. 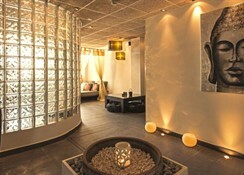 Unwind in the hotel spa, which offers a jacuzzi, sauna, Finnish bath, solarium and massage services. Golfing enthusiasts can choose from five golf courses within 40km of the resort too, so you won't have far to swing. 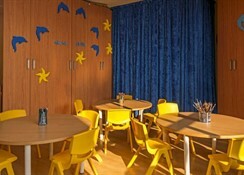 The TV room hosts evening entertainment shows and kids get their own mini club as well as swimming pool.